The European Athletics U23 Championships has wrapped up in Bydgoszcz, Poland. The championships is a biennial athletics competition for European athletes under the age of 23. The tournament brought together young athletes from 43 European countries. 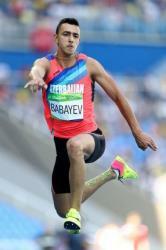 Azerbaijan's athlete Nazim Babayev has claimed a gold medal in the men’s triple jump, Azertac reported. He secured the medal with a jump of 17.18 meters. Simo Lipsanen from Finland took silver, while German Max Heb grabbed bronze. Nazim Babayev won the triple jump competition at 2015 European Games in Baku. He set a championship record, national junior record and world junior lead when he leaped 17.04 meters in the triple jump at 2015 European Athletics Junior Championships. In 2016, Babayev became the silver medalist of Balkan Athletics Championships or Balkan Games held in Istanbul, Turkey. 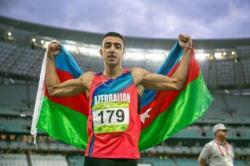 Azerbaijan's athlete also qualified for the 2016 Olympic Games in Rio for the Men's triple jump. Azerbaijan Athletics Federation was established in 1923 and reorganize in 1992. The Federation is a member of International Association of Athletics Federations (IAAF) and Asian Athletics Association of Federations since 1992. The first athletics tournament in the capital of Azerbaijan, Baku was held in 1992. Since 1993, the AAF has been operating as an independent body to manage the athletics.